The Raeburn is ideally situated to make the most of Edinburgh, a truly captivating city that draws fascinated visitors from across the world. An enchanting mix of history and culture, Edinburgh has been the Scottish capital since the 15th century and the main attractions and places of interest are easily accessible from The Raeburn, especially for those who enjoy a stroll along quaint cobbled streets and the chance to see stunning architecture up close in both ancient and modern styles. The centre of the city is divided into the Old Town, with the medieval castle towering over winding narrow streets and the ancient buildings huddling close together and the neoclassical New Town, which started to develop in the 18th century. The walk down the Royal Mile from the castle to the Scottish Parliament should in theory be a fairly swift journey, except for the possibility of being ambushed time and again by the arresting sight of historic homes and enchanting shops. 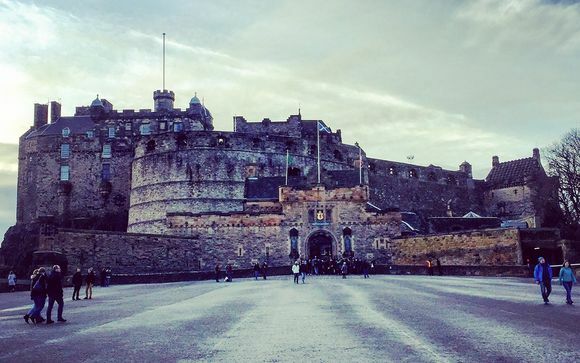 Edinburgh also boasts some of Scotland's finest museums and galleries, including the National Museum of Scotland, the National Galleries of Scotland, the Scottish National Portrait Gallery and the Scottish National Museum of Modern Art. It is also resolutely green, with the beautiful Princes Street Gardens tempting many visitors to leave the fabulous shopping attractions and cross the road to relax in the Gardens and enjoy some of the best views of Edinburgh Castle and Old Town. Just a mile from Princes Street you can find yourself enjoying the breathtaking and stark beauty of Holyrood Park, with Arthur’s Seat and the Salsbury Crags dominating the skyline. The Raeburn was built in 1832 as an elegant Georgian family home and has now been transformed into an exquisite boutique hotel, boasting ten bedrooms, bar, restaurant, library, private dining and conference room and outside terraced area, the only one of its kind in the area. The personalised service plays a huge part in the hotel’s appeal, conveying a reassuring sense of every possible need quietly anticipated and met. The flawless restoration of this B Listed house has been a delicate and extremely successful balancing act in retaining classic historical detail and original facades, while ensuring the seamless introduction of all the latest technology. Careful planning has ensured appropriate delineation of all the different areas within the hotel, which allows it to cater for a varied and discerning clientele. The Raeburn’s landmark location in Stockbridge, one of the most affluent and beautiful areas of Scotland’s capital city, is just a ten minute from the bustle of Princes Street yet still manages to offer a peaceful retreat. A major selling point of Stockbridge is undoubtedly the vibrant feel to the area and the longstanding tradition of community and welcome which sees so many people irresistibly drawn to it. The residents of the stylish flats and graceful townhouses of Stockbridge include families, professionals, artists and novelists and this eclectic mix is reflected in the variety of independent shops, galleries and restaurants making the area so lively and popular. 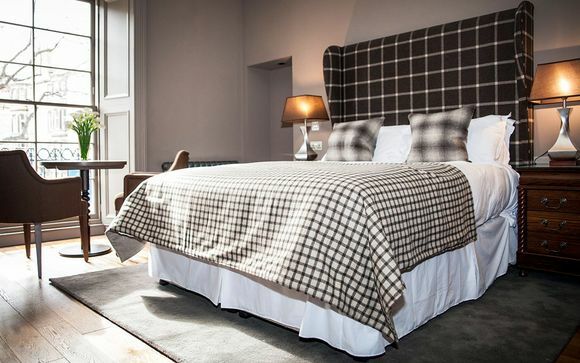 The Raeburn is the perfect destination for bleisure travellers looking for a traditional Scottish hotel and the restoration is also delighting local people, who are enchanted to see this elegant landmark brought back to life. The panelled walls and wooden floors of the spacious bedrooms are rendered pleasurably warm with deep pile rugs, while every practical need has been catered for with flat screen plasma televisions, individual Wi-Fi access points, espresso machines, hair dryers and GHD straighteners, bespoke designed partner desks, iPod docking stations, irons and ironing boards, in-room laptop safes and mini bars providing an excellent range of drinks and snacks. Egyptian cotton bed sheets and heavy weight fluffy towels and dressing gowns add to the sense of luxury, while ample dining space makes room service dining a delight. Marble finished Rainforest Showers in every bathroom and roll top bath tubs in six of the rooms echo the theme of classic quality, with bathroom fittings in the finest Victorian style providing beautiful finishing touches. This offer is based on a bed and breakfast stay. Includes a full Scottish breakfast. Just for you: Afternoon Tea with Prosecco for two people. Stay 2 nights and receive an additional Three Course Dinner for two on the first night. This smart, bustling brasserie has a classic menu of simple yet sophisticated British dishes, deliberately nurturing a vibrant, youthful atmosphere in the refined elegance of its historic setting. The Raeburn’s restaurant combines superb food and knowledgeable service and is fast becoming the venue of choice in Stockbridge and beyond for every special occasion. Transfers: are not included with this offer.